The Fairfield Inn Pensacola I-10 offers comfort and a convenient location whether you are in town for business or vacation. Located just minutes from the warm gulf waters, our hotel in Pensacola, FL puts guests beside I-10. We offer convenient access to many area attractions including the Naval Air Station, the beautiful campus of Pensacola Christian College and miles of beaches along the Gulf of Mexico. Following an adventure-filled day, step inside our spacious suites and enjoy complimentary Wi-Fi and Internet TV featuring popular streaming apps like Netflix and Hulu. Comfortable bedding and convenient pull-out couches help you and yours get a restful nights sleep. At the start of each day, visit us in the lobby to enjoy a hot, complimentary breakfast buffet, then relax and unwind in our beautiful indoor pool. 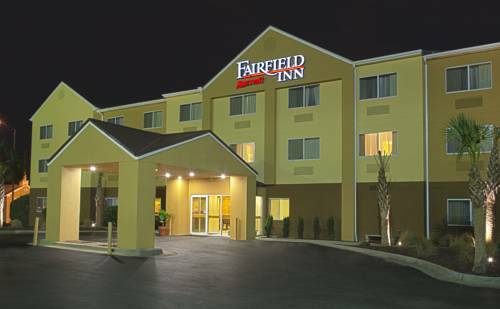 We ensure your stay in the Florida Panhandle will be as sunny as the sky above when you book with Fairfield Inn Pensacola I-10!